In a remote community where life is cheap, and people struggle to survive, one small Aboriginal boy shows us how courage can conquer even the greatest odds. 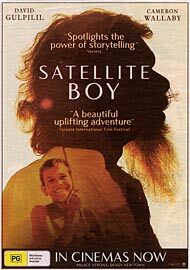 Satellite Boy is the story of Pete, a 12-year-old Aboriginal boy who lives with his elderly grandfather, Old Jagamarra. Home is the abandoned outdoor cinema in the outback town of Wyndham. When his grandfather's home is threatened with demolition by a mining company, Pete sees his world in jeopardy and sets off for the city. He is joined by his friend Kalmain, who has his own reasons for leaving town. Together the boys walk through epic and stunning Kimberley country and when they get lost in the bush, Pete and Kalmain find true friendship. A friendship that transcends the mundane world. The boys just make it to town by the deadline to demolish the old outdoor cinema. They find the owner of the cinema and convince him to change his plans—it may seem a small thing, but it changes and inspires the world for their families and their community. Satellite Boy shows a world torn between old and new, tradition and progress, nature and technology, while avoiding political grandstanding. Celebrating the importance of family, true friendship and cultural and spiritual identity, Satellite Boy is captivating and affecting. Still image of Satellite Boy. A newspaper advert for Satellite Boy. Catriona Mackenzie directed the award-winning and cutting edge Australian drama series Remote Area Nurse (RAN) and The Circuit. Catriona's short films include Box, Grange, Road, Redfern Beach and The Third Note. 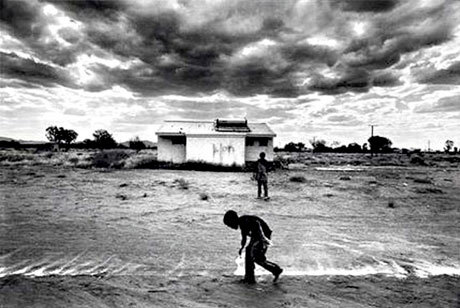 Shot on location in the Kimberley. Satellite Boy is the first feature film that received permission to film in the magical surroundings of the Bungle Bungle Range. It is Catriona's feature debut. Cameron Wallaby acts for the first time in this film. 2019Will Australia Ever Have a Black Prime Minister?